Wrist pain is one of the most irritating pain, especially if present on the dominant hand. A painful restriction of the hand movement puts tremendous functional constraints on a person. Thus, it may amount to huge economic losses in the form of frequent absence from work. Even treatment of such diseases requires the costly expertise of a hand surgeon. All in all, diseases of the hand mean loss of skill as well as wealth. Let us try and understand the details of this disease and restrict the damage to a minimum. Kienbock’s disease is a wrist pain causing disease, which is specifically associated with the wrist bone lunate. The process by which it occurs is called osteonecrosis. Osteonecrosis is a rapidly occurring osteoporosis, which causes death and fracture of a bone due to lack of blood supply. This disease was named after Dr. Robert Kienbock, who was a radiologist from Vienna. He observed and described the changes occurring in the lunate bone as early as 1910. The wrist bones (Picture 1) are small and glide over each other to bring about versatility in wrist movements. Disease of a single bone can affect the dynamics of the wrist and cause a painful restriction of all movements. The small size and clumped nature of wrist bones also makes assessment of such diseases very difficult. The wrist bones are arranged in two rows with 4 bones in each row. 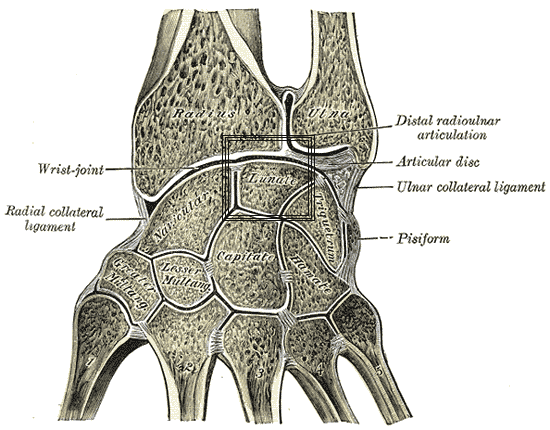 The lunate bone (Picture 1) is present in the proximal row. The blood supplying vessel to this bone is placed in an awkward manner, and is easily prone to injury from minor trauma. Repeated minor trauma especially during work or sports activities is responsible for permanent injury to the blood vessel, which in turn gives rise to Kienbock’s disease. Another anatomical feature commonly seen in people with Kienbock’s disease is a short ulna. The ulna and radius are forearm bones which provide support and varied movements to the human forearm. A shorter ulna puts excessive stress on the radius bone and leads to degenerative changes in the wrist. The lunate bone is in contact with the radius and shares the excessive stress leading to frequent injuries and osteonecrosis. Thus, it is clear that repetitive wrist trauma in certain predisposed individuals can lead to profound wrist damage in the form of Kienbock’s disease !